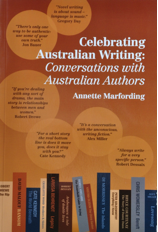 This is the fourth in my occasional series of Spotlight posts inspired by Annette Marfording’s Celebrating Australian Writing: Conversations with Australian Authors, and this time I’m featuring an indigenous author to coincide with Lisa’s (ANZLitLovers) Indigenous Literature Week. Larissa Behrendt is the perfect subject for what is also NAIDOC Week, not only because she has a few books under her belt, but also because her new book published earlier this year, Finding Eliza, explores how colonisers have written about indigenous people. Behrendt is a Eualeyai/Kamillaroi woman, and in her interview with Marfording describes herself as a Type A person. Looking at what she has achieved in her less that 50 years I can well believe it. She is currently Professor of Indigenous Research and Director of Research at the Jumbunna Indigenous House of Learning at the University of Technology, Sydney. She has won awards for her fiction, and been on the boards of various arts organisations including the Sydney Writers Festival, Bangarra Dance Theatre and the Museum of Contemporary Art. She was the National NAIDOC Person of the Year in 2009 and NSW’s Australian of the Year in 2011. As a lawyer, she has served on many boards, review committees and land councils, most of them indigenous-related. The list is impressive. Marfording’s interview occurred in August 2010. As she does with each of her interviews, Marfording commences with a brief biography of her subject at the time of the interview, and follows the interview with a biography update to the time of publication. It’s nicely done. I particularly loved this interview not only because Marfording asks, as she does in all the interviews, thoughtful, relevant questions showing her understanding of the subject, but because in this interview she covers some issues of particular interest to me. More on that anon. Marfording asked Behrendt, as she tends to ask all award-winners, what winning awards means to her. Behrendt admits that it is affirming to win an award but also says that the richest prize is when a reader tells her that a book “touched” them or that it’s “like me and I never see myself in a book”. telling a story that actually explains how a policy can impact on somebody’s life so personally, telling that story from a really human point of view, can influence more people than the most eloquent legal argument, especially when you can talk to somebody through the universals that they understand, like the love between siblings, the love between parents, etc. I’ve got very strong opinions, and I think it was a real learning process to learn that sometimes it’s through the whisper of a story that you can influence people more than through the louder, shouting style of activism. There were other questions too, but I want to conclude on two that focused on her as an indigenous writer, one on labelling, and the other on the issue of non-indigenous people writing about indigenous people (which, as you know, I’ve raised here a few times). What we like to say is that within our writing – and I think that’s true of every Aboriginal author – there are universal themes about family, about love, about betrayal, about hurt, about anger and jealousy, and these are the things that actually unite us. It’s a problem, in other words, when indigenous authors are seen to be writing only about indigenous subjects. Love it. The comment reminded me of Ellen van Neerven’s Heat and light (my review) in which some of the stories didn’t focus on or clarify race or ethnicity of the characters. They were just about people. For Behrendt, any story – whether the focus is an indigenous issue or not – is, essentially, about universals. through using her non-indigenous characters, by showing their ignorance, their violence, their sense of entitlement, their fear, she tells a very strong story about Aboriginal experience. You read her book and you know exactly what it was like for Aboriginal people. the story from the perspective of somebody who goes out as part of those hunting parties, and by getting into the psyche of the kind of person that can actually commit the most brutal aspects of a colonisation of a land, he tells a very strong story about Aboriginal people. So, while she doesn’t see it as a no-go zone for non-indigenous writers, she does believe that the level of ignorance makes it a difficult challenge. Another great interview with a writer who’s been in my list of must-reads for a long time. I’ll be starting soon with a short story. Watch this space. Note: All profits from the sale go to the Indigenous Literacy Foundation. To find out where you can purchase this book, please check Marfording’s website. ← Do you consult consumer reviews? That seems to me one of the most valuable things about fiction: the possibility of the author getting you inside the heads of people very different from yourself. That is probably quite naïve but it still accounts for so much of the excitement and responsibility of fiction. Behrendt is probably right both to see the major challenge involved in the non indigenous writer’s task and not to see this as a no go area. Yes, agree Ian, and I don’t think it’s naive because there are many readers who don’t value that or only value getting into heads they know and like. And I do like Behrendt’s reasoned attitude to the non-indigenous writer issue. Thanks Lisa. Yes, unfortunately it came out after the interview I think, didn’t it? It was published in 2011, and was the Vogel winner. It went on to be nominated for a swathe of awards as well. But hey, we know as well as anyone that it’s just not possible to keep up with all the new books that come our way, so she may not have had time to read it. Anyway, I’m pleased that she names examples where things have been handled well. I like open-mindedness wherever it occurs. The interview was done in August 2010, Lisa, so Wilson’s book did come out after the interview. But anyhow, she of course, could only give a couple of examples in an interview. I wonder if she’s written an essay on this topic? You’ve sold me! I definitely need to read Marfording’s book. Your spotlights are fascinating. Oh good Michelle. She would be pleased to hear this. The interviews are great, as you’ve clearly seen, and there are many more wonderful writers in there to explore. Wow, Behrendt is one busy woman! It is interesting how the books/authors she cites tell a story about indigenous people but don’t seem to try to inhabit the point of view from the inside. It seems a much better way to approach the subject than to say, write a story from the pov of a 15-year-old indigenous girl when the author is a white man. Yes, I noticed that too Stefanie. You can see what she’s getting at. There’s still that issue of what happens when main characters meet indigenous people. At that point the writer may very well have to speak for those indigenous characters. I’d love to see her right more on this topic. What a worthy contribution to focus on Larissa’s interview in my book! It’s one of my (many) favourites because she is such a deep thinker and also makes a lot of intriguing comments about the Northern Territory intervention. Thanks Annette. I’ll change the link then in my post. You’re right about her thinking. She was an excellent interview subject.